Military Style Foldable Shovel | BUDK.com - Knives & Swords At The Lowest Prices! This military style shovel is just the right size! Keep this stainless steel shovel with you so that you are always prepared. The convenient size and the included nylon sheath make this foldable shovel the perfect companion. 5 3/4" folded, 9" ov. 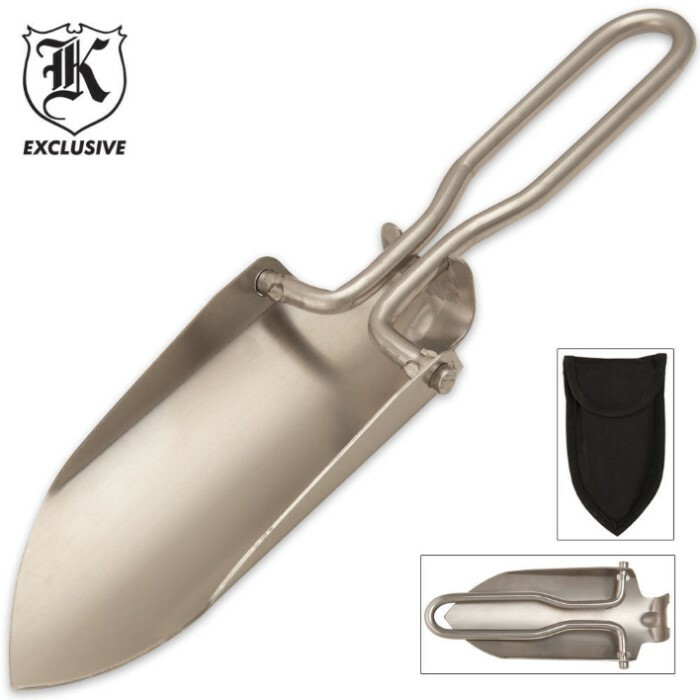 I recently purchased several of these shovels for my technicians to obtain soil samples. They are by far the best small shovel I have ever used. All of my techs love them. They are very strong for their size and the folding handle allows them to easily fit in our response bags. The shovels clean up quickly and with the included storage bag they can be cleaned and stored for the next project. This "Military" style folding shovel was purchased as a survival item and has not been used. The quality appears to be as good as ones costing 3 times as much. The nylon sheath was a plus. Appears to be a good solid small diging implement for camping or survival use.